Thanks for sticking with me on that journey through the feels about Fenway. Onto the rest of Boston: the FOOD. After the game, we walked up to Cambridge – a beautiful walk on a summer evening. 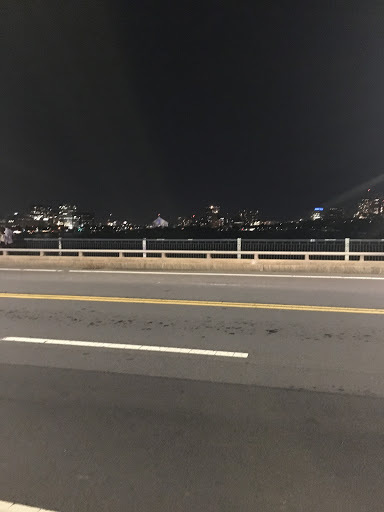 The view from the Mass Ave bridge is stunning at night. My iPhone camera certainly does not do it justice, but celebrate with me for a moment that I managed to snag some photos without a single car or person getting in the way. 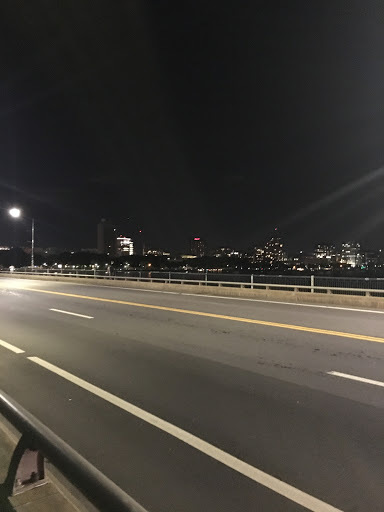 We walked through MIT’s campus and met up with a friend at Naco Taco. GUYS. I friggin’ love tacos. And these were no disappointment. Give me hipster taco bars or give me death. I had a duck confit taco with pomegranate molasses and sweet potatoes, and a lamb taco with assorted vegetables and mint-yogurt deliciousness. Max got a pig’s head torta with bacon, avocado, pickled onion, and a guajillo chile broth – which I am sure was wonderful but the single bite I had was not my cup of tea (I am not a big fan of most pig products, so more for him, I suppose). I had a Notch Pilsner (from Notch Brewery in Salem, MA) – a pretty standard pils, good for a summer night but not the most amazing beer I’ve ever had. Great accompaniment to the very flavorful tacos, so it worked out quite nicely. We headed back to the hotel and crashed for the night. Our checkout time was 11am, so we planned on a late brunch the next morning on the way out of the city. I really wanted to go to Toro in the South End because mimosas and tapas are my favorite things – but they had a bonkers long wait to sit outside, which we needed to do since we had both animals with us, so we had to find somewhere else. Cue comical adventure driving around the same circle of Mass/Tremont/Washington streets while I kept pulling up restaurants on Yelp to try to find something. Yelp, y’all gotta give your “dog friendly restaurants” a little more clarity because at least three places that were listed as pet friendly most definitely did not have outdoor seating. But I digress. Lots of lovely restaurants in the South End of Boston, and I would like to go and actually eat at many of them next time we are in Boston sans pets. But it worked out, because we ended up at the SoWa open market and food truck festival. Be still my dirty hipster foodie heart. Nitro cold brew! Homemade dog treats! Challah bagels and local gin and GIANT SQUASH. If we lived in Boston I would be there every weekend during the summer. Max got a bagel and some coffee and we headed over to the food truck section. There were tons of awesome food trucks there – to the point where it took me a half hour or so to decide what I wanted to eat. I got an avocado BLT stuffed sopapilla from Papi’s Stuffed Sopapillas which was LIFE CHANGING. Seriously, how have I never seen stuffed sopapillas before? And then we got a chocolate glazed donut from Blackbird Donuts. Insert drooly face here. 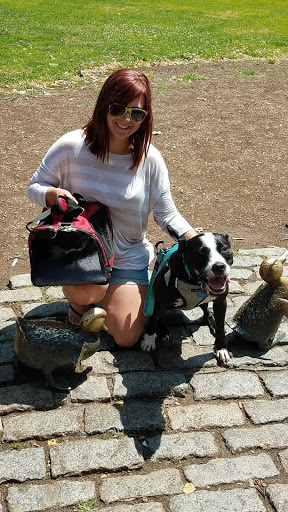 So the cat got to “enjoy” exploring Boston – as much as a cat can enjoy being carted around a city in a bag – and the dog got lots of treats and pets and attention. 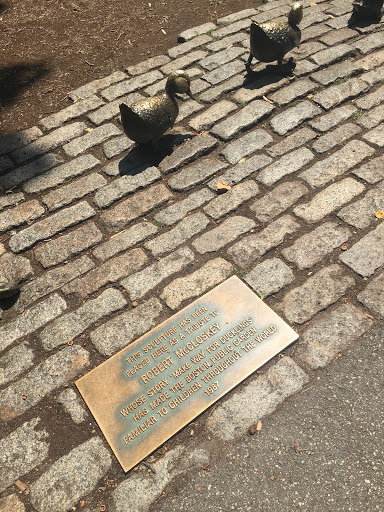 I love the Public Garden, and as previously mentioned, Make Way for Ducklings is my favorite children’s book. So, I figured we should probably take ‘the kids’ to the duck statues and take their pictures with the ducks. The dog was THRILLED to be walking around the Garden – so many other doggos to smell and play with. 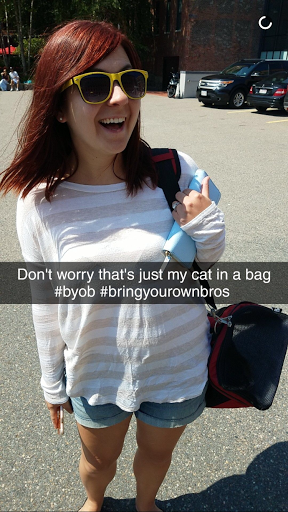 The cat was…not thrilled, but when is she ever? And I got my pictures with the ducks, so now leaving the East Coast and being so far away from my favorite city hurts a little bit less. Thanks for a great (albeit short) visit, Boston. I hope to see you again real soon. Posted on August 8, 2017 January 14, 2018 by DaniPosted in road trip, travelTagged animals, beer, boston, festival, food, food truck, gardens, market, massachusetts, parks, restaurants, road trip, tourist, travel.